Acknowledged author wrote INTERMEDIATE ALGEBRA 5 comprising 960 pages back in 2016. Textbook and etextbook are published under ISBN 1259610233 and 9781259610233. Since then INTERMEDIATE ALGEBRA 5 textbook received total rating of 3.5 stars and was available to sell back to BooksRun online for the top buyback price of $35.39 or rent at the marketplace. 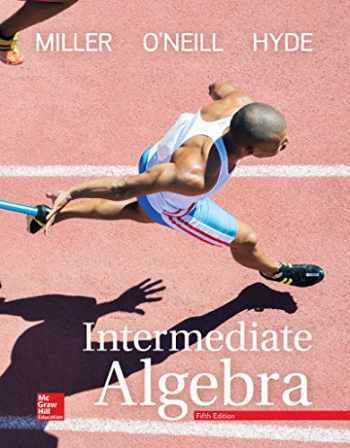 Get Better Results with high quality content, exercise sets, and step-by-step pedagogy!The Miller/O'Neill/Hyde author team continues to offer an enlightened approach grounded in the fundamentals of classroom experience in Intermediate Algebra 5e. The text reflects the compassion and insight of its experienced author team with features developed to address the specific needs of developmental level students. Throughout the text, the authors communicate to students the very points their instructors are likely to make during lecture, and this helps to reinforce the concepts and provide instruction that leads students to mastery and success. Also included are Problem Recognition Exercises, designed to help students recognize which solution strategies are most appropriate for a given exercise. These types of exercises, along with the number of practice problems and group activities available, permit instructors to choose from a wealth of problems, allowing ample opportunity for students to practice what they learn in lecture to hone their skills. In this way, the book perfectly complements any learning platform, whether traditional lecture or distance-learning; its instruction is so reflective of what comes from lecture, that students will feel as comfortable outside of class as they do inside class with their instructor.